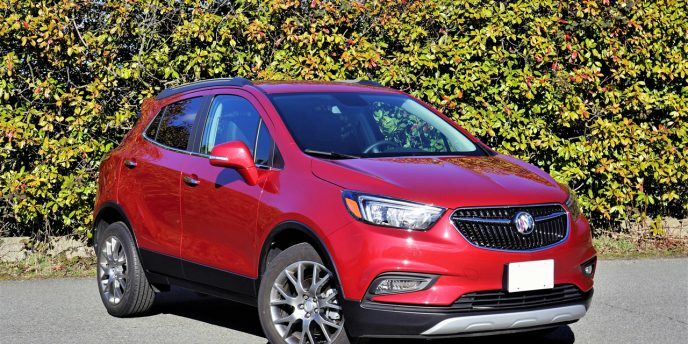 Every time I book a Buick Encore for testing I don’t give it much thought. It’s a subcompact SUV that needs to be covered because of its reasonably good sales, but it’s not the type of vehicle that elicits a lot of passion. And then once inside I’m reminded of how nice it is, and on the way home how easy it is to drive. I must say it’s even better for 2017, in every respect. GM just gave it a thorough mid-cycle update that I’ll be reviewing in detail soon, but for now let’s just say it’s frontal styling has seen significant improvement (the grille is modernized, headlights filled with LEDs and silly hood-mounted “ventiports” are gone), its interior gets a number of styling and technical enhancements (keep reading for the latter), and it still drives very well. My tester was in base Sport Touring trim so it featured the slightly less potent 138 horsepower version of the 1.4-litre turbo four, and it was only configured to drive the front wheels as tested (AWD is optional). I’ll go over its driving dynamics more thoroughly in my review, not to mention its comfort level, roominess, and more. Of note, all 2017 Encores receive standard proximity-sensing access with pushbutton ignition, a feature that’s optional with most competitors, while great sounding Bose audio is also standard, as is electronic noise cancellation that helps keep Buick’s renowned “Quiet Tuning” as hushed as ever. Another feature worth noting is integrated Wi-Fi via 4G LTE internet connectivity, capable of turning this little subcompact SUV into a rolling hotspot. Additionally, a new 4.2-inch colour TFT multi-info display rests within the redesigned primary gauge cluster, and an even more intriguing 8.0-inch infotainment touchscreen featuring an updated Buick IntelliLink digital interface now includes Android Auto and Apple CarPlay for enhanced smartphone connectivity. Have you seen the new CR-V yet? Honda’s compact SUV is so popular it would be difficult to miss. Our top-tier Touring tester shows significant progress over its predecessor, but not just because of its bold new styling. This fifth-generation CR-V rides on a totally new platform shared with the 10th-gen Civic, while its sole powertrain is also pulled from Honda’s bestselling model. The 1.5-litre turbocharged four-cylinder makes 190 horsepower and 179 lb-ft of torque in the CR-V, resulting in spirited yet fuel-efficient performance, a standard continuously variable transmission (CVT) especially helpful in achieving the latter dynamic with an estimated five-cycle Transport Canada fuel economy rating of 8.4 L/100km city and 7.0 highway in FWD, or 8.7 and 7.2 respectively in as-tested AWD. While engine performance, road-holding and ride quality have all improved, the biggest changes come in interior refinement and roominess. We won’t go into detail right now, but suffice to say Honda has enhanced the CR-V’s interior design and quality to similar levels as its superb new Civic, while the more comfortable SUV will fit larger occupants and more cargo. Even base LX trims make the CR-V stand out from the ever more crowded compact SUV category, with standard 17-inch alloys, projector headlights featuring auto high beams on AWD trims, LED taillights, pushbutton ignition, 7.0-inch infotainment with Apple CarPlay and Android Auto, plus much more. Mid-range EX trim adds standard AWD, 18-inch alloy rims, fog lamps, turn signals on the side mirror housings, six-speaker audio, USB charge points in back, a powered glass moonroof, Honda’s fabulous and exclusive LaneWatch passenger-side blindspot monitoring camera, and more, while EX-L trim includes a better eight-speaker audio system, a powered liftgate, etcetera. Our top-line Touring trimmed tester upped the ante with full LED headlights, unique 18-inch alloy wheels, additional chrome trim, and dual exhaust pipes, while proximity-sensing access including a hands-free tailgate gets you inside where you’ll find convenient rain-sensing wipers, a navigation system with turn-by-turn directions, better sounding nine-speaker audio (thanks to a subwoofer), a larger panoramic sunroof, and more. 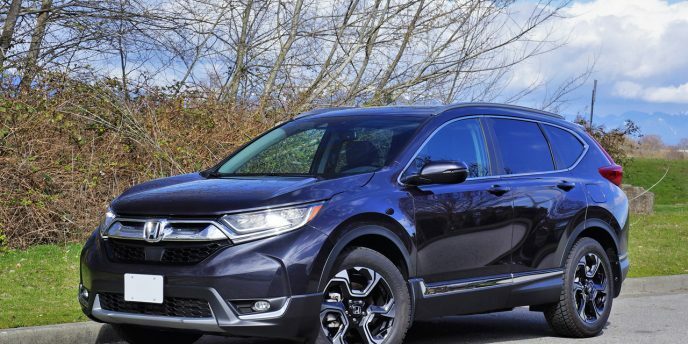 The new CR-V helped Honda claw back first place in the compact SUV segment from the Toyota RAV4 over the first two months of 2017, the RAV4 having earned the position during calendar year 2016, although last month saw Nissan’s new Rogue top the segment’s sales chart for the first time. This race is hardly over, with the competition as fierce as it gets and the new CR-V easily up to task. We’ll tell you how the new Honda rates in an upcoming review (not to mention how the new 2017 Rogue SL AWD Platinum and 2017 RAV4 Platinum compare in separate reviews), and let you in on any new developments in the sales race. 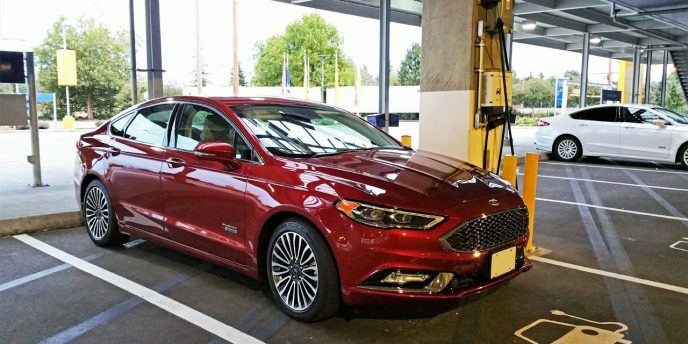 Energi is Ford-speak for plug-in hybrid or PHEV, and this important future-looking model continues with the 2017 Fusion’s mid-cycle makeover. The changes to the entire Fusion line are subtle but effective, the grille now appearing less Aston Martin-like and therefore more acceptable to those of us who’d rather not see a favourite sports car brand plagiarized, the headlamp clusters scalloped slightly on their lower edges, a new more horizontal lower fascia providing a cleaner yet sportier look, redesigned taillights that now feature a chromed strikethrough stretching across the trailing edge of the deck lid to visually connect the two, and other small details modernizing the popular mid-size sedan. Also new for 2017 is top-tier Platinum trim level that sits above the previous-best Titanium model. That’s what we drove in our recent weeklong test, a $44,588 near-luxury sedan that adds a unique Sport grille, stunning diamond-quilted perforated leather upholstery, a leather-adorned dash and armrests, tasteful woodgrain trim, a heatable steering wheel, ventilated front seats, navigation, rain-sensing wipers, a universal garage door opener, a powered glass sunroof, and a number of active convenience and safety features such as adaptive cruise control with stop-and-go, autonomous pre-collision assist with pedestrian detection, blindspot warning, lane keeping assist, enhanced semi-autonomous park assist, and more. 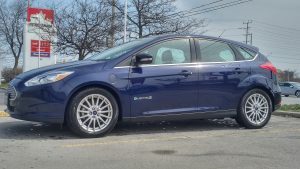 Only Hyundai’s Sonata joins the Fusion Energi in offering plug-in hybrid technology to the popular mid-size sedan segment, this allowing owners to recharge a larger battery capable of driving longer distances on 100-percent electric power, not to mention at higher speeds than conventional hybrids can do in EV mode. While the Fusion Energi is only good for about 30 kilometers of pure EV propulsion before its 2.0-litre four-cylinder gasoline engine joins in for assistance and regular hybrid usage ensues, a full charge can be achieved in just 2.5 hours which makes it possible for commuters to recharge at work or those who use their cars throughout the day, for business or running personal errands, to recharge their cars at shopping malls or other facilities that offer fast charging stations. The 2.0-litre engine makes a mere 141 horsepower and 129 lb-ft of torque alone, but when combined with its electrical assistant raises output to 188 horsepower. 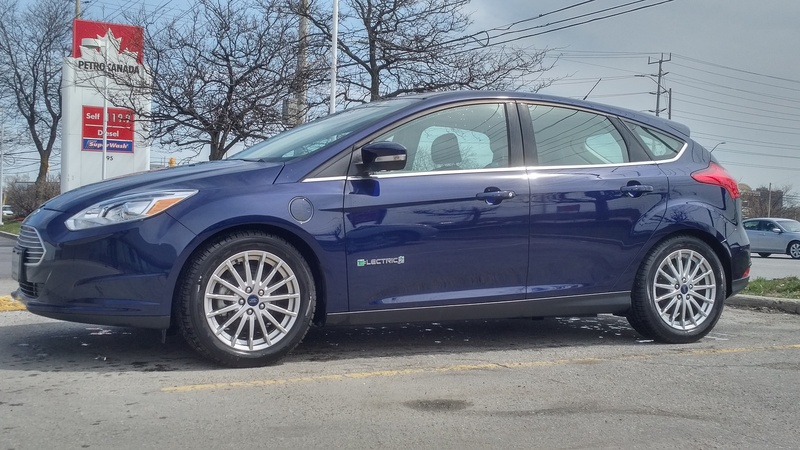 Ford doesn’t provide total torque as it’s a difficult figure to estimate, but strong performance off the line has caused auto experts to estimate it between 180 and 190 lb-ft. 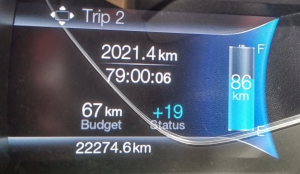 The Fusion Energi drives the front wheels via a continuously variable transmission (CVT), par for the course amongst hybrid drivetrains, while fuel economy is estimated to be 5.8 L/100km in the city and 6.5 on the highway when in regular hybrid mode, or 2.7 Le/100km when factoring in regular usage of its EV mode. 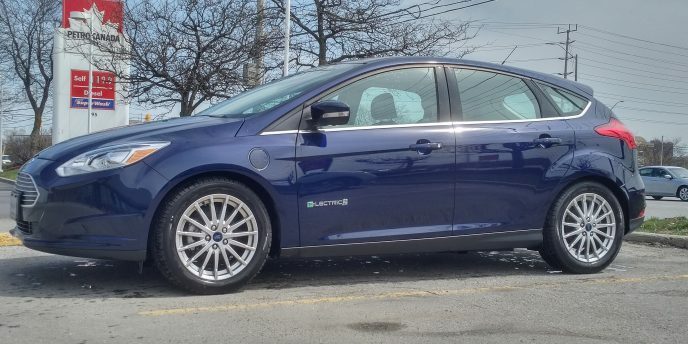 After thirteen months of service and over 22,000 kilometres our Kona Blue 2016 Ford Focus Electric continues to provide very quiet, trouble free, and emissions-less service. Life with the Focus has been extremely pleasant, almost without compromise. Typical days involve about 80 kilometres of mixed city traffic and high-speed travel. Here in Ontario, the High Occupancy Vehicle lane allows electric vehicles to utilize these lanes, which tends to save about 15 minutes of commuting time each way to the office. On some days the Focus has been pressed into service to carry hockey bags and sticks as far as 65 kilometers each way. During the winter months, when the use of the heater cuts into the available range, these trips need to be carefully planned. Such is life with a generation-one electric car. As you can imagine, the driver of a gasoline-powered Focus would not have to plan quite so carefully. But with the cost of regular no-lead fuel approaching $1.20 per litre, the economic benefit of an electric vehicle is becoming more evident each month. Check out our detailed story after the Focus achieves her one year anniversary next month. 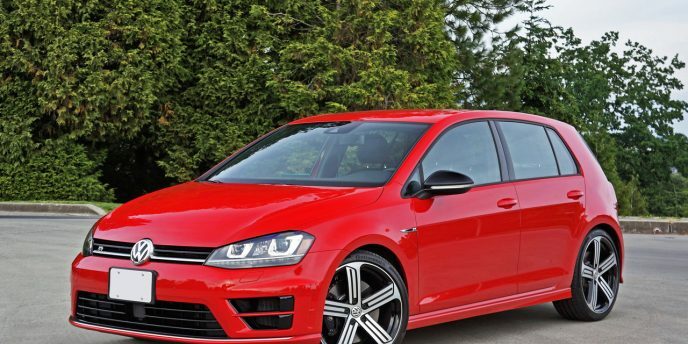 Ask any auto scribe to name their top 10 cars and Volkswagen’s GTI will likely show up somewhere on the list, or at least it did before this Golf R arrived. At first glance it doesn’t look all that different, other than a few unique aero aids, 19-inch alloys, a quad of chrome-tipped tailpipes poking through a rear diffuser, and a big “R” badge on the liftgate, but VW’s usual subtly (compared to Subaru’s dinner table-sized WRX STI wing) masks a seemingly rally capable drivetrain boasting a 292 horsepower 2.0-litre four-cylinder engine with 280 lb-ft of torque (the same mill as used in the Audi S3 and TTS Coupe), a six-speed manual or dual-clutch automated transmission, and a sport-tuned version of Volkswagen’s already capable 4Motion all-wheel-drive. We test this quickest-ever Golf and fastest VW overall with the autobox, complete with standard paddles, and without giving much away ahead of a forthcoming review, its powertrain provides a more mature and refined delivery than, say, the immediate punch of the aforementioned WRX STI. Likewise its fully independent suspension is made for aging buttocks, pampering with standard adaptive dampers that offer three levels of comfort-oriented firmness. The R arrived for model year 2016 and therefore the 2017 model carries forward mostly unchanged except for standard blindspot monitoring, and standard Driver Alert, which pays attention to a variety of parameters and then recommends you take a break when you may be getting tired. The 2017 model also includes a Sport HMI display that provides performance details within the base 6.3-inch colour infotainment touchscreen (that also features a rearview camera), while the exterior paint palette has grown to include Limestone Grey Metallic. You’d think this most potent Golf would be racier looking than the GTI inside, but in fact it’s cabin focuses more on delivering a more mature (there’s that word again) premium experience than luring in those easily swayed by flashy styling and glitzy gizmos. Its high (for a mainstream volume-branded compact hatchback) $40,695 base price might have something to do with its more luxury-oriented approach, the GTI with its more provocative interior and eye-grabbing exterior, replete with front fascia styling strakes, targeting a younger demographic with its more attainable $29,495 starting price. Therefore, leather upholstered sport seats with light grey contrast stitching come standard with the R, as do piano black lacquered inlays with beautiful blue accent lighting on the doors. Additional sporting elements include a flat-bottomed leather-wrapped sport steering wheel, also with light grey stitching, a leather- and metal-adorned shift knob and leather boot (also contrast stitched), plus metal foot pedals with rubber grips. The only way to make the Golf R more practical would be to add a wagon variant, but so far VW hasn’t responded to the ultimate wishes of its ardent niche five-door fans. Still, standard 40/20/40-split rear seatbacks maximize utility. An optional Technology package adds a proximity-sensing 8.0-inch infotainment touchscreen that’s one of the best in the biz thanks to Apple CarPlay, Android Auto, navigation, superb graphics, and quick operation, while dynamic cruise control, lane-keeping assist, and parking sensors are also part of the upgrade. High demand makes sure the Golf R sells out long before any 2018s arrive, so it’s good news that Volkswagen Canada managed to get their hands on more for the 2017 model year. How do we know? We’ve got a near top-line 400 horsepower 3.0-litre turbo V6 Reserve trimmed model in our garage this week and so far so good… or rather, so far so great! The Continental offers a brand new face in the luxury segment, which is nothing new for Lincoln that’s been changing up its design language every half decade in a seemingly never-ending quest for a new trademark look since the classic Rolls-Royce-like waterfall radiator went out of style back in the ‘90s, along with the last car to wear the Continental nameplate. Still, Lincoln may just be onto something that sticks with the new Continental. 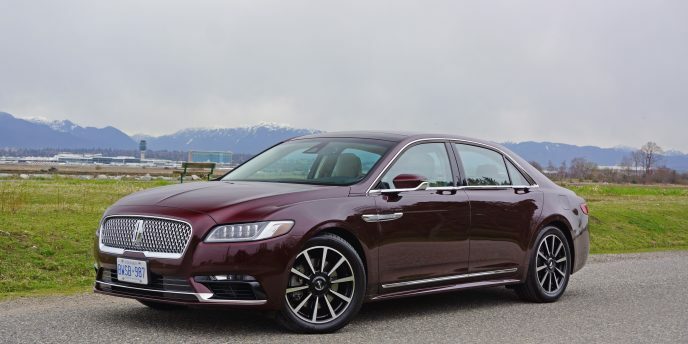 We’ll leave the driving dynamics details for our upcoming road test review, but suffice to say that standard torque-vectoring AWD and electronically controlled damping makes sure this big sedan handles like Lincoln’s old LS without the ride harshness. Considering the new Continental sits on a stretched and otherwise modified version of the current mid-size MKZ platform architecture, that’s a sound bit of automotive engineering. Did the changes to Ford’s fourth-generation 2017 Escape go far enough to keep it in the upper echelon of the hotly contested compact SUV mix? We’ll answer this question and many others in our upcoming review of the 2017 Escape Titanium. 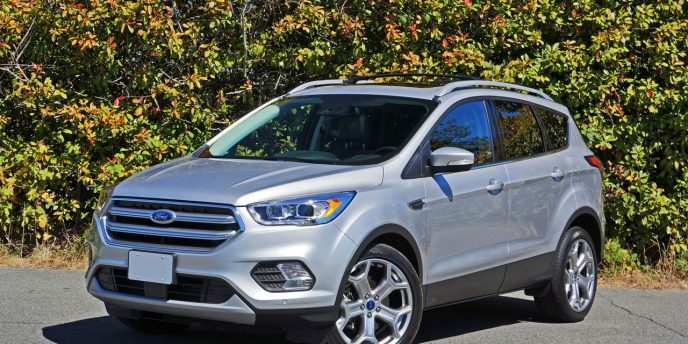 Ford gave its popular Escape a redesign for 2017, with the most prominent differentiator being a new grille, while behind that six-sided aperture is a new 180 horsepower 1.5-litre turbo-four in select trims, replacing last year’s 1.6-litre four. Base models continue with the 2.5-litre four, and top trims like this Titanium feature Ford’s 2.0-litre turbo. Do you want a few review teasers? The Escape now includes auto stop/start that shuts the engine off when it would otherwise be idling, helping to save fuel and reduce emissions, while inside there’s a new electromechanical parking brake, as well as Ford’s new Sync 3 infotainment system in upper trims, which is one of the key reasons buyers should consider the Escape over its competitors. updated semi-autonomous self-parking system that can steer the Escape into perpendicular slots as well as parallel spots, while available Sync Connect let’s Escape owners check fuel level, unlock the doors, or start the engine remotely from their smartphone. Come back soon to get all the details about Ford’s 2017 Escape Titanium. We’ll let you know how it drives, how its features work, and how popular it is with Canadian compact SUV buyers. 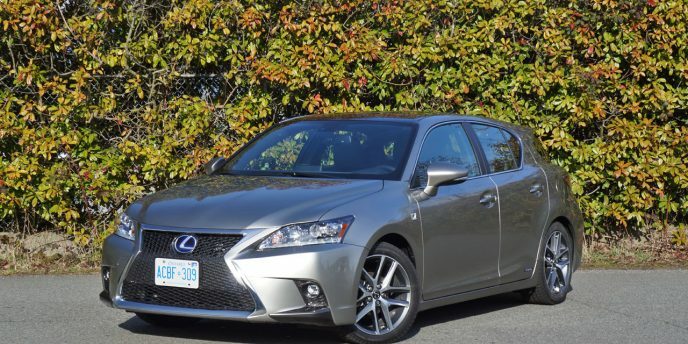 With fuel prices once again soaring in most Canadian cities, the long-in-tooth Lexus CT 200h just might be one of the most relevant entry-level luxury models available today. Only Audi’s A3 e-tron can give it a run for its money regarding fuel economy, although the German is initially much more expensive than the $32,750 CT. Updated just a few years ago, the CT remains fresh looking thanks to Lexus’ new spindle grille and aggressive frontal body cladding, while its profile and sporty five-door body style has always been good looking. A 134 horsepower 1.8-litre Atkinson-cycle four-cylinder engine drives the front wheels via a continuously variable transmission (CVT), while a proven (a.k.a. old-school) Ni-MH battery pack powers an electric motor that more often than not is used to assist the gasoline engine in true hybrid form, although the CT can drive under pure EV power for short distances at low speeds (bumper-to-bumper traffic, parking lots, etc). If the power unit sounds familiar, it’s identical to that used in the previous Toyota Prius, and like the Prius the CT delivers superb claimed fuel economy rated at 5.5 L/100km city and 5.9 highway. While the drivetrain is pulled from the Prius, the platform architecture is sourced from Toyota’s global compact car line, which made sure a fully independent suspension lived up to Lexus’ handling and ride quality standards. Its handling is even more engaging in as-tested F Sport trim.